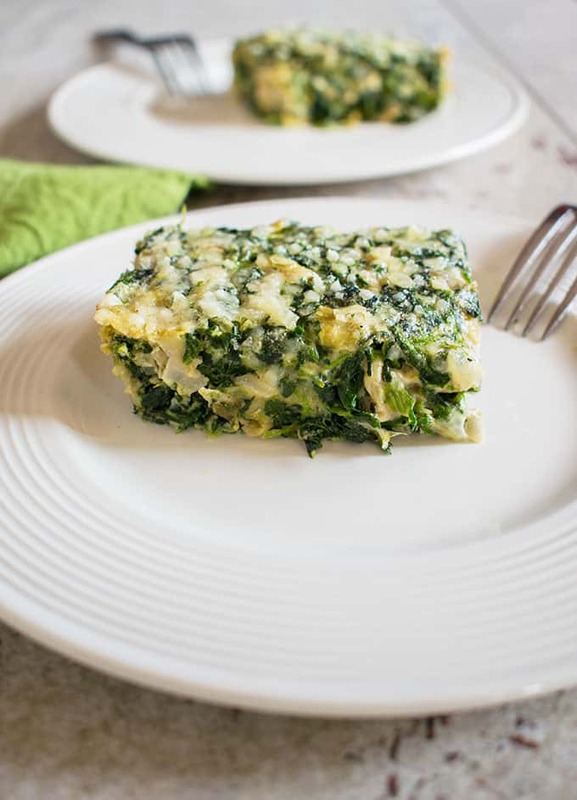 Try Creamed Spinach Soufflé with Artichokes and Parmesan when you need a special side dish! This is a family favorite we often have on Thanksgiving. Okay, now that it’s fall, I feel the need to start planning our Thanksgiving menu. This creamed spinach soufflé with artichokes and Parmesan will be gracing our table, as it has for many Thanksgivings over the years. Unlike Mom’s Spinach-Ricotta Pie, this recipe has no crust. 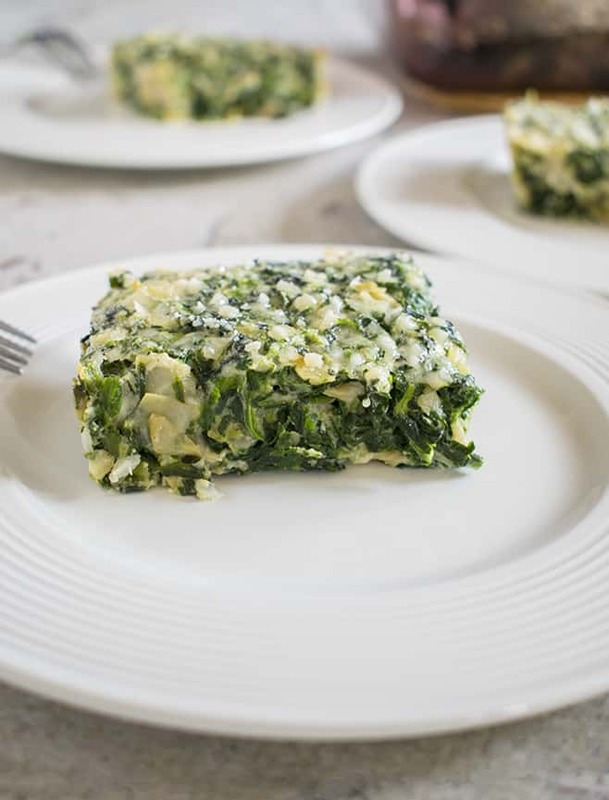 The spinach soufflé comes together with a Parmesan cream sauce made with egg yolks, while beaten egg whites provide volume. More Parmesan is sprinkled on top for a cheesy accent, but the creamed spinach and artichokes are the main feature. Feel free to add extra Parmesan, if you wish! I just had to add garlic, artichokes and more Parmesan though. Creamed spinach, artichokes and Parmesan were meant to be together, you know? And mostly using evaporated milk, plus some 2% milk, makes for a thick and creamy sauce without including actual cream. By the way, I prefer to use frozen artichoke hearts instead of those bloated ones in the jar. They were a life-changing discovery for me a few years ago, since artichokes are my favorite vegetable. This creamed spinach soufflé is one of those dishes that’s universally enjoyed, especially in my family. My kids have loved spinach since they were babies, which makes this Mamma happy. So, if you’re figuring out your own Thanksgiving menu, this spinach soufflé is a delicious option. Here are some frequently asked questions (FAQ) I get about this recipe. Can the Spinach Soufflé Be Made Ahead of Time? You have a few options to make this ahead of time. You can assemble and bake it a couple days prior to serving. Then reheat it in the microwave or oven. 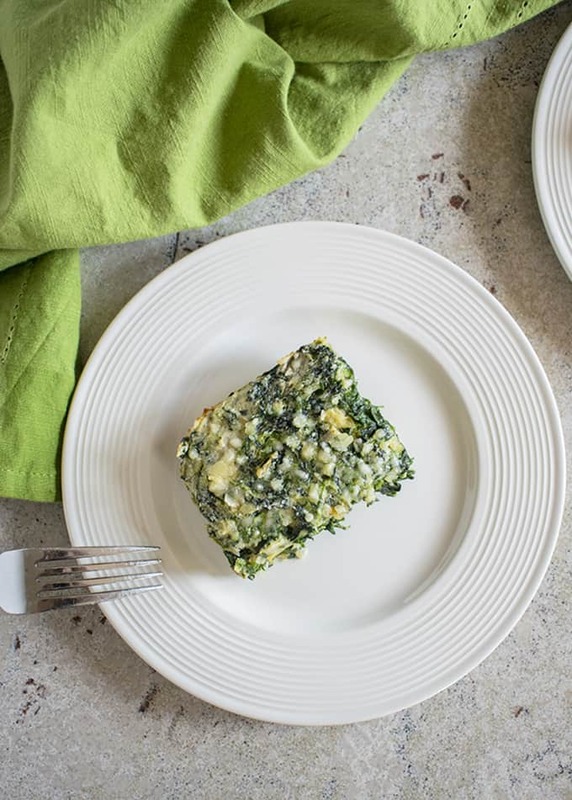 You can assemble the spinach soufflé the day before and refrigerate it without baking. The next day, let it come to room temperature for 30 minutes, then bake. You may need to add a few minutes to the baking time; check for doneness by inserting a knife in the middle and seeing if it comes out clean. You can start a couple days ahead of time by thawing and drying the spinach and artichokes, as well as grating your Parmesan. Refrigerate those. The following day, you can make your cream sauce and assemble the soufflé. Then you can wait another day to bake it, if you choose. I like the idea of prepping the veggies and cheese at least a day ahead. It means less time in the kitchen all at once! Can the Spinach Soufflé Be Frozen? You should be able to freeze the spinach soufflé after it’s baked and cooled. Thaw it overnight in the refrigerator, blot any moisture and reheat slices in the microwave or oven. 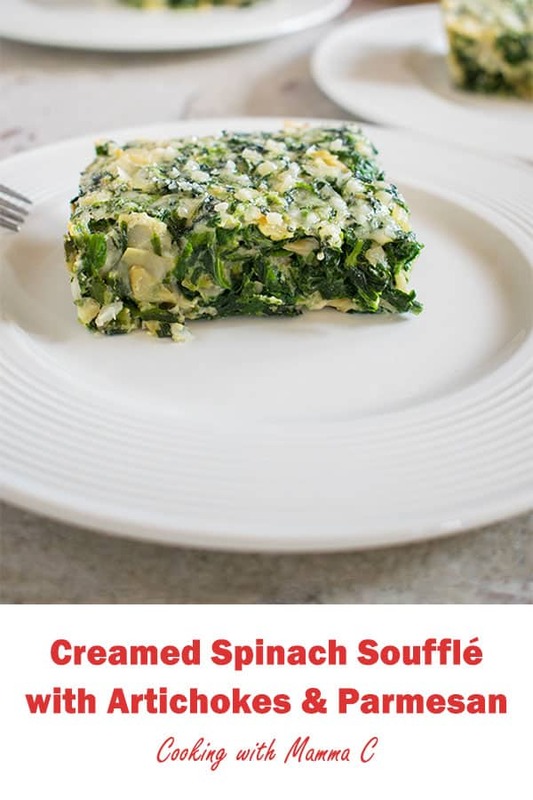 The full recipe calls for a 9×13 pan, but you can use half the ingredients and bake the spinach soufflé in an 8×8 pan (affiliate link). That’s what I did for the photos, baking the soufflé for the full 25 minutes. That’s it, folks! Hit me up with any other questions. 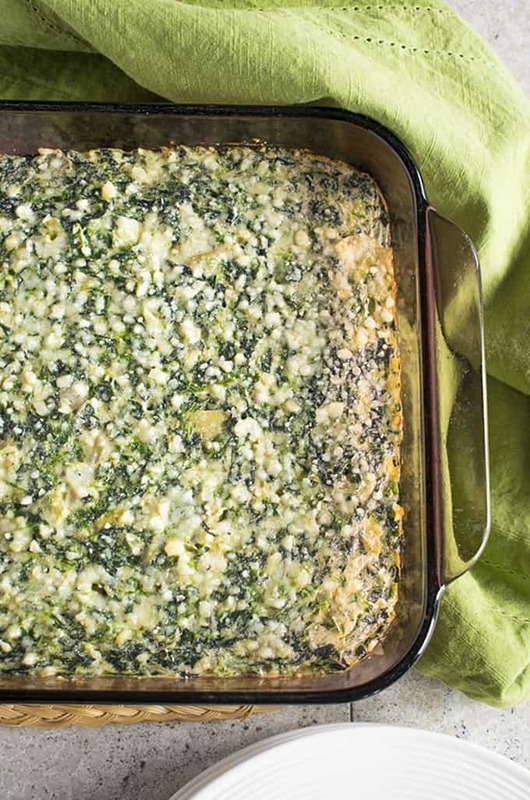 And if you love spinach, be sure to check out my Spinach, Artichoke and Asiago Dip and this Baked Vegetable Risotto with Asparagus and Spinach. A Spinach Soufflé accented with onions, garlic & Parmesan. The perfect side dish for gatherings! Thaw spinach in the microwave, covered. (I do a couple batches at 3 minutes on high power.) Place spinach in a colander to drain in the sink. 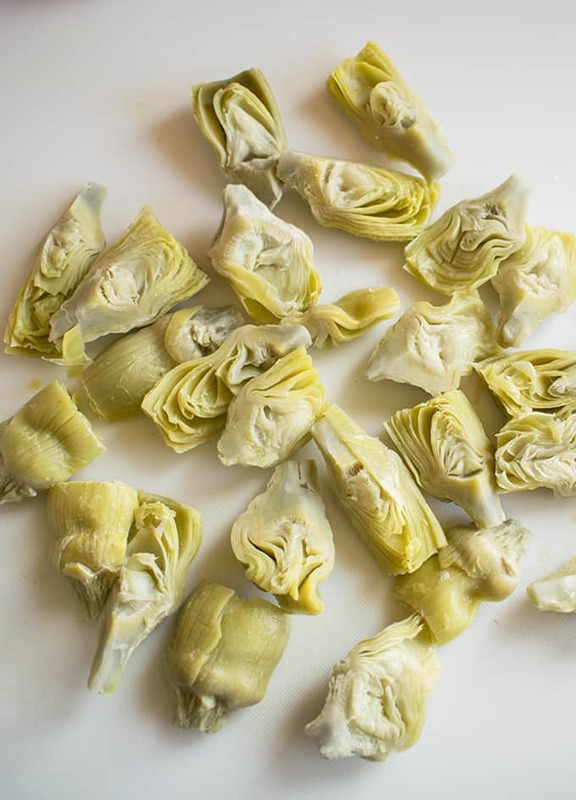 Thaw artichoke hearts in the microwave (they will be easier to chop if they are still a bit frozen.) Chop the artichokes and pat them dry. While the vegetables are in the microwave, chop the onions and garlic. Grease a 9x13 pan with cooking spray. Preheat the oven to 350 degrees F.
Crack eggs, separating the whites into a medium bowl and the yolks into a small bowl. Using a hand mixer, beat the egg whites, starting at low speed and increasing to high, until stiff peaks form. (It will look fluffy, like meringue.) You can chill the egg whites until they are needed. In a 2-quart saucepan, melt butter over medium heat. Add onions, and after a couple minutes, add the garlic. Cook until the onions are soft, at least five minutes total. While they are cooking, whisk the evaporated and 2% milk together. Leaving the egg yolks in a separate bowl, beat the yolks with a fork. Place your milk mixture and egg yolks near the stove. In the saucepan, stir in the flour, salt and pepper until blended. Gradually stir in the milk mixture, and continue stirring until the sauce boils and thickens slightly. Spoon a small amount of the sauce into the egg yolks and stir them together to temper the eggs. Slowly pour the egg mixture into the sauce in the pan, stirring quickly to prevent lumps. Stirring constantly, cook until the sauce thickens, but do not let it boil. Remove the sauce from the heat and stir in 1/4 cup of Parmesan. Squeeze the spinach dry (I use a clean dish towel that doesn't shed fibers; paper towels also would work.) Add the spinach and artichokes to a large bowl. Pour the sauce over the vegetables and stir to combine. Using a wire whisk, gently fold in the beaten egg whites until they are incorporated into the mixture. Transfer the vegetable mixture to the 9x13 pan and smooth the top evenly. Sprinkle on 1/4 cup of Parmesan. Bake uncovered for 25 minutes, or until a knife inserted into the center comes out clean. Store leftovers covered in the refrigerator for up to four days. This recipe can be cut in half for an 8x8 pan that will make 8 servings, as shown in the photo. I made this last night as the fresh spinach was on sale and I had the frozen birds eye artis. (So good plain with just butter on them!). It was delicious! My family of five loved it. I did change the frozen spinach to 4 – 8 oz fresh bags, steamed, strained and squeezed. I also made evaporated milk with “real milk” thus eliminating the chemical my picky tongue hates in anything canned. I also doubled the Parmesan as we do love our parmy here! So. Good. My new go to veggie dish. I love your changes, Mary! How did you make the evaporated milk? Can this be made a week prior and frozen? I have not tried it yet but it sounds wonderful. Entertaining a large group and would love to get several dishes done ahead. Tracy, I’ve never tried it, but it sounds like it might work, if you bake it, cool it and freeze it. I like the idea of making this ahead of time, since it’s somewhat labor intensive. do you think i can make this the day before and reheat or will it get dry? Lenore, we reheat this in the microwave, and it doesn’t get dry. I’ve never tried reheating it in the oven though. I’d reheat only the portions you think you’ll need. 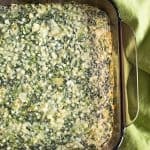 I love a spinach recipe and this casserole came out look beautiful. I have to give this recipe a try. Thank you so much for sharing this. It looks delicious! Thanks, K. I hope you enjoy it!